Regardless of the course that you are applying for, you will be asked to send a Statement of Purpose (SOP) along with your application to the university. This is an opportunity for you to convince the universities that you are an eligible candidate for their program by telling them your story. It is the single non-official document in the application that can carry up to 30% weight-age in deciding your success for admission. Every SOP (aka letter of motivation) is and should be unique! This is the document using which you portray the picture of yourself as a person to admission committee. 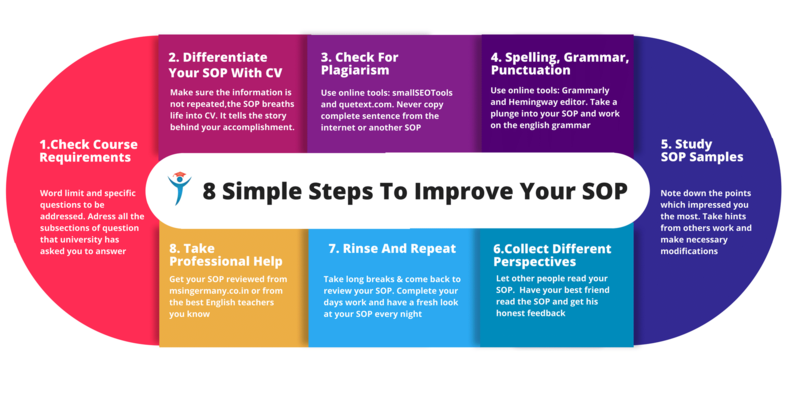 Your SOP is also a display of your thought process and proof of your ability to communicate effectively in English. A well-written SOP gives you an edge over all the candidates with a similar profile as yours. Check your university course requirements to see if they have asked for any specific questions to be addressed in your SOP (many times they do). Note down the limit for SOP length e.g. 500 words, 2 pages, 4500 characters etc. Do NOT read any other SOPs at full length before you write yours. This is because by reading the SOP(s) you will force yourself to follow the content and structure of that SOP(s). Remember that your SOP needs to stand out and clearly, no one can tell your story better than yourself. However, I know that it is hard to just sit down and start writing without a clear picture of what you’re going to write. This guide should give you a framework on top of which you can build your story. Prepare your Curriculum Vitae (CV). If you have done this already, go through it once. This will put you on the track right away. This will help you in contrasting the content of SOP from that of a CV. Remember that all your academic details and qualifications are already listed in the CV, you shouldn't be repeating them in your SOP. Think about one clear break-point, the one that has set you on your current path and is a major motivating factor for you to pursue this degree. This is optional, but it helps if you have one. List out 10 different things from your life that have an influence (direct or indirect) on your decision to pursue this degree e.g. when I was in primary school, I used to take lessons from my grandfather on Vedic mathematics. This helped me develop my interest in Science and eventually lead me to pursue a career in Engineering. Now you have enough data to get started. Sit down and start typing your story. Now you must breathe life into your CV. Get your scorecards and achievements to talk for you and tell the story behind them. Keep your writing lively. Bring in your thought process. Just let it all flow, you can do the editing later. Get in a close friend of yours and have him look at your writing; not to correct your grammar but to get a different perspective. Ask him (i) Is the essay coherent and easy to follow? (ii) Does it reflect my work? (iii) Does it emanate the right spirit and motivation? and do the course-correction accordingly. Do your day’s work and come back to your SOP every once in a while. Read it and ask yourself the above questions. Keep editing it for few days. Add insightful features and remove unwanted details until it reaches a satisfactory level. Now you may have a look at other SOP samples online or elsewhere. This is just to make sure that yours is on par with the competition. You may also choose to include or exclude something based on this. 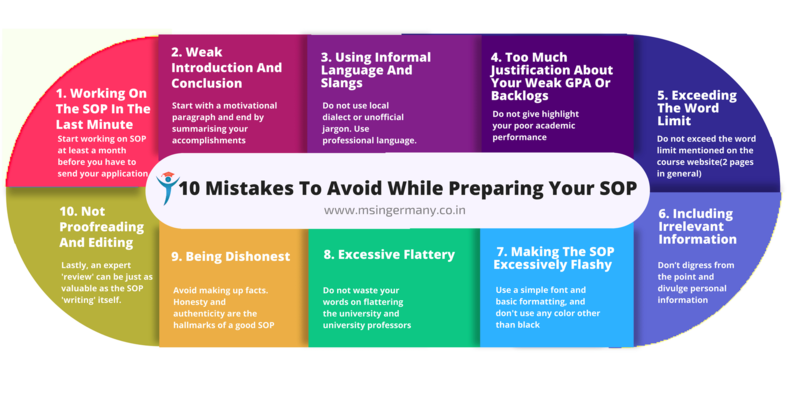 But don’t be biased to an extent that your SOP loses its uniqueness. This is an important step. If your university has asked you to address a specific question(s). Make sure you have addressed every single part of the question. e.g. what are your research interests and why? why our university? Now is the time for the final editing. Contact the best English teacher you know and request them to check your grammar, punctuation, and spelling. You can also use free tools like Grammarly and Hemingway editor. Also, make sure that you don’t exceed the given word limit. This is very important and shows that you are being professional about your work. Lastly, if you haven’t done this already, use these tools from MS word (i) justify (ii) insert header and footer. Save this file as a pdf. This will instantly make your document look far more professional. Writing a good SOP will usually take more time than you might think. So start early and give yourself a sufficient time to write, revise, edit and finalize your SOP. The admissions officer won’t have more than 3-5 minutes to go through your SOP; thanks to a barrage of applications which keep increasing every year. If your SOP just follows the same typical style as others, it won’t grab his/her attention. If you are applying for multiple universities, you must give each one an impression that the SOP is specifically written for that university. Do your homework and try to be clever about which details to include/exclude based on the university profile.